Montmartre is located in the 18th arrondissement, in the northern part of the city, on the right (north) bank of the Seine. Word Word Montmartre (Montmartre) is used for name of the hill and the surrounding areas of the city. Montmartre is one of the most visited places in Paris. Montmartre hill height is 130 meters. This is the highest point of the city. On top of the hillб еруку is one of the most famous churches in Paris - Sacre-Coeur. Sacré Coeur is often called фы the most beautiful city cathedral. The hill offers a beautiful view of the city шn good weather. Montmartre became famous due to the fact that there many famous people цуку lived at different times. Everyone knows that the price of the works of famous artists can be very high. But the authors of the works were often poor people during his lifetime. At the end of the 19th century, room rate was significantly lower in this area of Paris than in the city center. This attracts many artists here. Perhaps artists were attracted also by beautiful views of the city, people and businesses (bars, cabarets and other entertainment). Here are the names of some people who lived here: Renoir, Van Gogh, Toulouse-Lautrec, Picasso, Braque and Modigliani. Today, Montmartre is one of the most visited places in Paris. Almost every tourist considers mandatory to come to the hill and to visit connected with the life of famous artists places. You can also order your portrait from working on the Place du Tertre artists. Montmartre is located to north of the Louvre and to north-west of the North Station (Gare du Nord). The distance to the Louvre Museum is about 2.8 km, Arc de Triomphe 3.8 km, to the Eiffel Tower, 4.7 km and to Gare du Nord 1 kilometer. The nearest metro stations: Anvers (line 2), Abbesses (line 12), Barbès - Rochechouart (lines 2, 4), Château Rouge (line 4) and Pigalle (lines 2, 12). The nearest RER station is Gare du Nord (North Station). There are bus routes 30, 31, 80 and 85 near the hill. How to get there? Many streets lead on top of Montmartre. Choose the direction to the top. Walk from Anvers Metro station along Steinkerque Street and then the stairs or by the funicular. Walk from Abbesses metro station along the Rue Yvonne le Tac street and then upward or along the rue La Vieuville street and then through the streets and staircases upward (several routes). Sacre Coeur Basilica (Basilique du Sacré Cœur) is perhaps the most beautiful church in Paris. The church is located at the top of Montmartre hill. The Basilica is built of white stone. Inside the basilica, there are stained glass windows and mosaics. Cathedral is open daily from 06:00 to 22:30. Access to the observation deck (the dome) is open from 08:30 to 20:00 in summer and from 09:00 to 17:00 in the winter (2017). Time of access to the dome may vary depending on the weather. Entrance to the Cathedral is free (except for the observation deck). Official website: www.sacre-coeur-montmartre.com Photo is from the official site. Tertre Square (Place du Tertre) is the most famous square Montmartre. Square is located approximately 130 meters to the west of the cathedral. Artists are selling their work to tourists on the square. 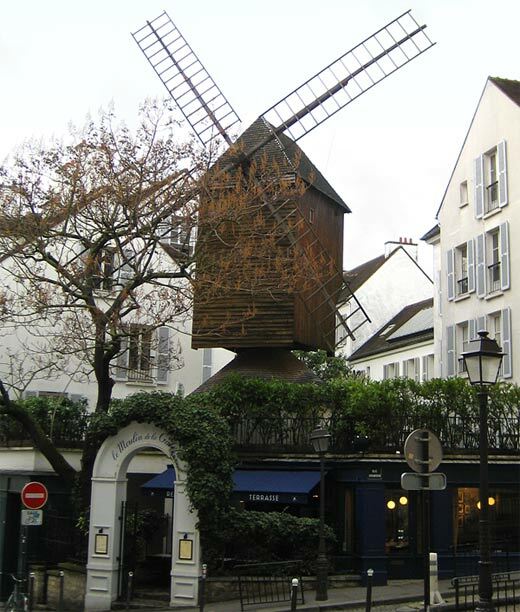 Moulin de la Galette is a windmill on the hill of Montmartre. The mill was built in 1622. During its existence, the mill was also used as a restaurant, a music hall and a TV studio. This mill is known that it was depicted in paintings of many famous artists. The mill is located at a distance about 400 meters to the west of the basilica, at the intersection of Lepic and Girardon streets. Espace Dalí is a museum, which houses an exhibition of Salvador Dali works. The museum has a large collection of works of the famous artist. Most part is sculptures and engravings. The museum is located next to the Place du Tertre (just west). Address: 11 rue Poulbot, 75018 Paris. Despite the fact that Montmartre has long been in the city territory, the vineyard been preserved here. About 400 - 500 liters of wine (900 - 1000 bottles) is produced here. Every year, in October, harvest festival is held in Montmartre (wine festival). The vineyard is located on the corner of rue des Saules and rue Saint-Vincent, at a distance of about 300 meters north-to the west of the basilica. The nearest metro station is Lamarck / Caulaincourt. Montmartre surrounding areas are not considered as the best place for tourists’ accommodation. This is partly due to the located south-west of the hill districts of the city (around the Place Pigalle square), which had a dubious reputation. Despite this, there are many who want to live exactly in Montmartre. You will be able to choose a good hotel, after reading tourists reviews. For example, hotels rated among tourists. Best Western Hotel Montmartre Sacré-Coeur. Address: 66 Boulevard Barbès, 75018 Paris, France. Hôtel Montmartre Mon Amour. Address: 7 Rue Paul Albert, 75018 Paris, France. Use the booking service to find the hotel in Montmartre. You can see Montmartre and the Sacré Coeur location on the map. 3. Moulin de la Galette windmill. 4. Salvador Dali Museum “Espace Dalí”. When clicking on the map you will be redirected to the map of Paris. To find the right hotel in Paris, use any reservation service. You can compare prices, read customer reviews, choose and immediately book a hotel here. Are you interested in group or individual guided tours in Paris? Tickets to the Louvre, Disneyland and the Eiffel Tower? Look at the information here. How to get to Paris? Flights and train tickets look here. Book a transfer from the airport before your trip.